BMS - Building Management System: is a computerized or digital control system that controls many or all of the systems in a building, including the HVAC system, lighting system, building access controls, etc. COP - Coefficient of Performance: is a description of the efficiency of a heat pump. It is calculated by dividing the heating or cooling output of a heat pump and dividing it by the energy input - the energy you have to purchase to run the heat pump compressor, fans and pumps needed to run it. Energy Model: An energy model is a detailed heat loss and heat gain calculation for a building. The calculation takes into account heat transfer to and from the space inside the building to the outside air. It takes into account the construction of the building walls and roof, including insulation values, mass of the structure, orientation of the different components to the sun, color of the material. An 8,760 hourly model is used to calculate the heat loss/gain based on the historical average temperature data (usually 20 years) for the building location. The modeler then overlays building occupancy schedules, lighting schedules, ventilation, etc. to account for internal heat gains, heat losses and gains from the mechanical system, etc. in detail, on a room by room basis. The software than calculates the actual heating and cooling loads required for every hour of the year. The detailed energy analysis allows us to calculate the energy consumption per day, month or year. This can be translated into energy cost based on local utility rates. It also allows us to calculate energy transfer to and from the GHX and size the system accurately. GCHP - Ground Coupled Heat Pump: A heat pump system that uses the ground as a heat source and/or heat sink. A heat exchanger is typically built with high-density polyethylene pipe, is built in the ground under or around a building. Heat transfer fluid, usually water or water mixed with antifreeze (propylene glycol, ethanol or methanol) is circulated through the pipe. As the fluid circulates through the pipe it warms or cools to the temperature of the earth or rock around it. The fluid is circulated through a heat pump that either extracts heat from it or rejects heat to it, cooling or warming the fluid. When heat is taken from the fluid, the heat pump produces hot air or hot water that is used to heat the home or produce hot water. 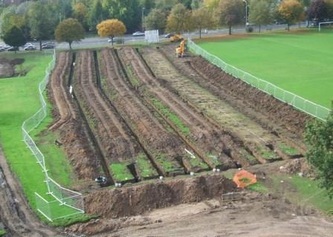 When the heat pump cools the building, heat is rejected to the fluid, warming it to disperse it in the ground. 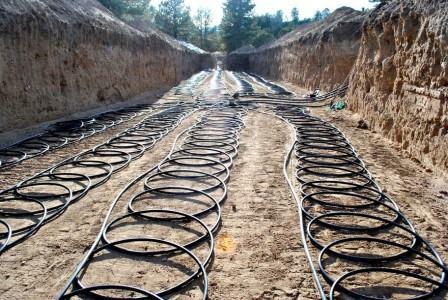 If ground water is available, it can be pumped directly through the heat pump, and can provide a heat source for the heat pump or absorb heat rejected to it by the heat pump. 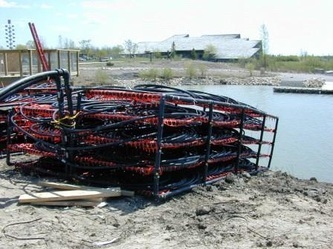 GHX - Ground Heat Exchanger: Is a heat exchanger buried in the ground around or under a building. Typically it is built by burying high-density polyethylene (HDPE) or cross linked polyethylene (PEX) pipe in the ground. 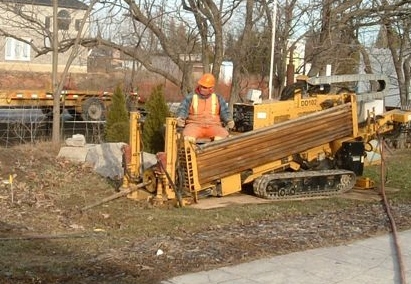 The pipe can be buried in excavated trenches 4' to 10' (1.3 to 3 m) deep, inserted into horizontal or vertical boreholes, or laid in the bottom of a pond, lake or the ocean. GHX Circuit: Most GHX's are designed and built with one or more "supply and return runout pipe pairs". Connected to the runout pipe pairs are 2 or more GHX circuits that are installed in vertical boreholes, horizontal trenches or submerged in bodies of water. The GHX circuits are the primary heat exchange surface areas that absorb heat from the ground or water or reject heat to it. HVAC System - Heating, ventilation and air conditioning system: is a building system designed to maintain the required temperature and air quality in occupied spaces in a building. It will include equipment that provides heating and cooling for the space, ventilation and filtration to provide adequate air quality and a distribution system to deliver heating, cooling and ventilation air to all parts of a building. IDP - Integrated Design Process: This is a process when designing a building, all of the stakeholders in a project work closely together in an attempt to achieve the most efficient building and system possible. As an example, a lighting designer may determine that the energy cost savings from installing more efficient lighting in a building is not very cost-effective because the electricity saved by the lighting will not pay for the additional cost of installing the lights for more than 30 years...and would normally recommend against installing the lighting. But, when the reduced heat gain from more efficient lighting is taken into account, the capacity of the cooling system can be reduced enough to pay for the more efficient lighting, and savings resulting from both the lighting and cooling system are taken into account, it results in an overall saving for the owner. Multi-source heat pump: A heat pump with access to more than one source/sink element of thermal energy. Common elements include, ground, solar, air, biomass, waste heat. Often applied with a thermal battery or thermal energy storage devices. Thermal Conductivity Test: A thermal conductivity test measures the ability of the soil or rock a heat exchanger is buried in to transfer energy. To conduct a thermal conductivity test (TC test) of a vertical borehole, HDPE pipe is installed in a borehole to the depth that is most appropriate for the site and building loads. Heated water is circulated through the pipe. It is typically heated using electric elements powered by a generator. 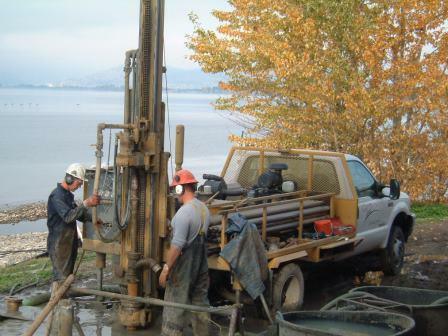 The flow rate and temperature of the water is measured as it enters and leaves the borehole. The test is typically operated for at least 48 hours. Flow rate and temperature data are recorded usually every 2 minutes. This is used to calculate the thermal properties of the borehole to determine how much heat can be rejected to or extracted from the borehole. This is used in conjunction with the building energy loads to calculate the number, spacing and depth of the boreholes for a proposed GCHP system. Thermal Energy Storage: Tanks or devices used to store thermal energy. This can include tanks to store chilled water or ice (cold storage) or tanks used to store hot water or a variety of phase change materials (was, eutectic salts, rock, concrete or thermal mass, etc.). Energy can also be stored in earth surrounding the piping of a GHX field. U-tube: A plastic pipe assembly consisting of 2 lengths of plastic pipe (HDPE or PEX-a) joined at one end by a molded plastic U-bend. 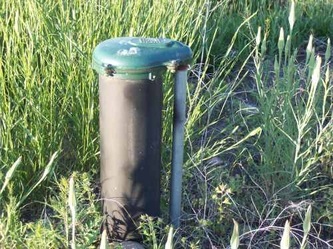 The U-tube is inserted into a vertical or horizontal borehole. In most cases bentonite and/or cement grout fills the annular space inside the borehole around the U-tube piping. Heat transfer fluid is circulated through the U-tube and through a heat pump. When there is a difference in the temperature of the heat transfer fluid and the earth and/or rock surrounding the U-tube piping, energy is transferred to or from the ground.